LOS ANGELES - Dec. 10, 2018 - PRLog -- Grammy Award winning singer/songwriter Kalani Pe'a has received an official nomination for the 61st Annual Grammy Awards for his album release, "No 'Ane'i" (We Belong Here). Pe'a is nominated in the category of Best Regional Roots Music Album. The 2019 Grammy Awards will be televised on CBS television network on Sunday, February 10, 2019. The title of Pe'a's Grammy nominated album "No 'Ane'i" reflects the importance of playing a part in the foundation of Hawaiian culture, the preservation of Hawaiian identity and values that keep Hawai'i thriving. The album features twelve songs, each telling a story about Kalani Pe'a and the life he has led. Among the twelve songs, there are eight original compositions Pe'a wrote or co-wrote. 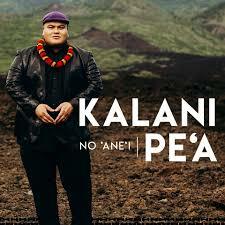 Pe'a shares, "'No 'Ane'i' (We Belong Here) is the title and overall theme of my sophomore album. One of the main concepts for this album was to remind our people of the value of becoming primary resources of our land. We must become that primary or secondary resource for our people so that we maintain and retain the resources and so that our people thrive in Hawai'i. This album will hopefully give people the significance of building a foundation and becoming part of that foundation. Once the foundation is secured, we can identify the importance of how to thrive as people; that our heritage lives on; that we identify our cultural values and practices and how we think as people, and to uplift and uphold the values of how we act and think in a Hawaiian perspective while maintaining our Hawaiian identity. We are responsible for becoming a pillar for our people; to carry out the torch and light of our ancestors. Hawaiian language is the foundation to everything. We belong here. This is our land. We must thrive!" The album features Amy Hānaialiʻi Gilliom, Willie K, Imua Garza, Aiau Koa, Wailau Ryder, Dave Tucciarone, Casey Olsen, Hoʻokena, Moon Kauakahi, Kauanoe Kamanā and Aaron Salā. The album is available now on iTunes for digital downloads.